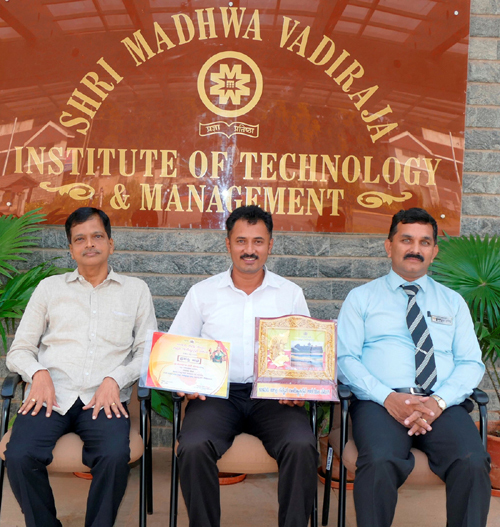 Udupi, 06 Dec: Joseph G M Rebello, a staff of Shri Madhwa Vadiraja Institute of Technology & Management (SMVITM), Bantakal, near here was awardeKannada Rajyotsav Award – 2018, in recognition of his social service activities. The award ceremony was held at Atal Bihari Vajpeyi Auditorium, Rajathadri, Deputy Commissioner Office, Manipal, here on Friday, November 30. The award was presented by Jayamala, Karnataka minister for women and child development and Kannada culture and Udupi district in-charge minister. The management, principal, staff and students of SMVITM have expressed their happiness for being honored with such prestigious award.